These images are among some of the images that have won or placed in competitions (juried and non-juried). 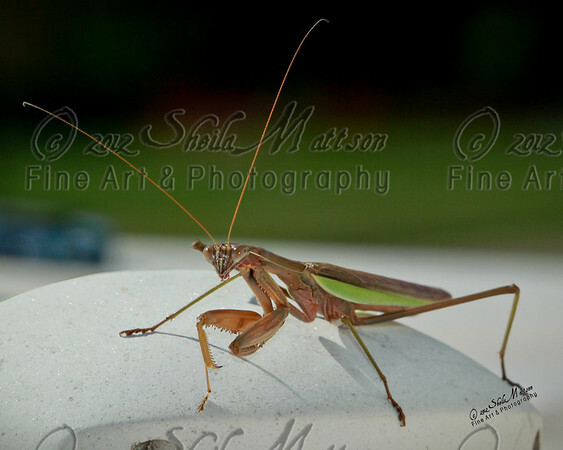 This praying mantis was really interesting to watch. He seemed quite attentive, and whenever I moved, his head and eyes would follow. I've never seen an insect do that before. He was safely on top of our boat about 4-1/2 feet in the air. While I was photographing the praying mantis, my chocolate lab strolled by a few times oblivious to the insect on the boat. However, the praying mantis followed my dog with her eyes, and when it perceived the dog as a threat, it reared back and stood taller. What a curious creature. I heard that this praying mantis isn't a common sight in MN, but I have yet to confirm that.